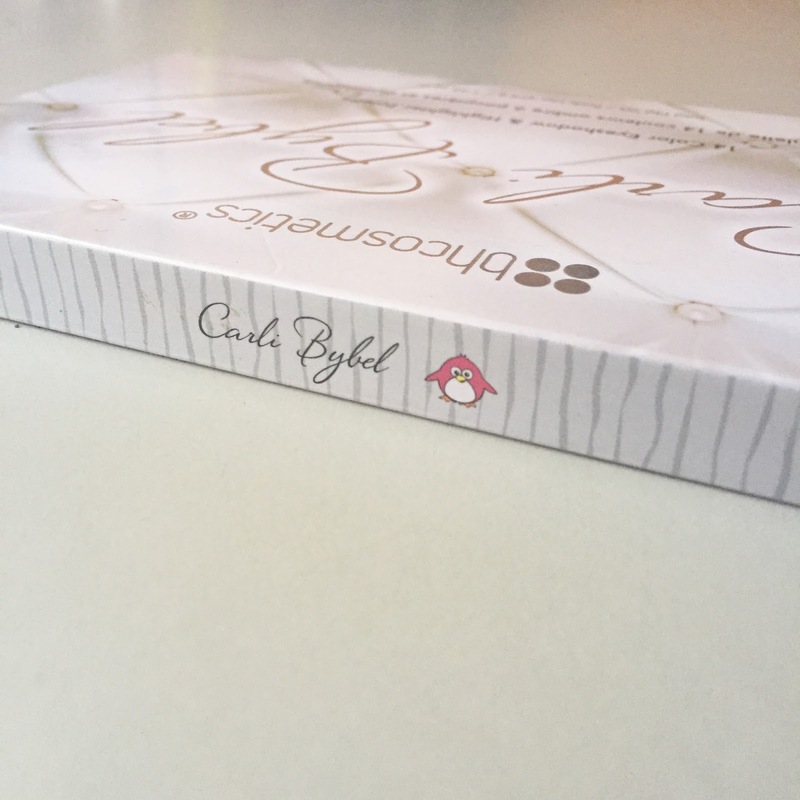 today i’m going to be talking about the super-raved BH Cosmetics and Carli Bybel collab palette. here's a fact - this palette nearly broke the internet. why, you ask? because this heaven-sent palette was only $12.50USD when it's released on September 8th, 2015. for a brand that is cruelty-free and has good quality products, this palette is definitely one that everyone can afford. i had this palette for quite a while now but i never had the chance to post a review....... ok that was a lie. truth is, everytime i thought about doing it i always got distracted and somehow ended up watching Youtube. so, yeah, 30 years later, i'm finally here to tell you how i feel about this precious baby of mine. before i get distracted again, let's get started! the packaging on this palette is so simple, which is made of cardboard. it's pretty slim and lightweight hence travel friendly. well, to be honest at first i kinda felt like "damn this thing looks cheap" (i'm sorry Carli don't hate me). but after what i've seen inside, somehow it changed my mind. naww, are you ready to sneak inside? how can you not fall in love with this palette? i mean, LOOK, PEOPLE, LOOK. these 14 gorgeous shades nearly made me cry when i first saw it. i really love the floral detailing on the highlighting shades. i thought they add more character to the entire look. the interior gets dirty easily since the shadows can get on the pretty white frame, but thanks to the material of the palette, it's easy to wipe anything off. 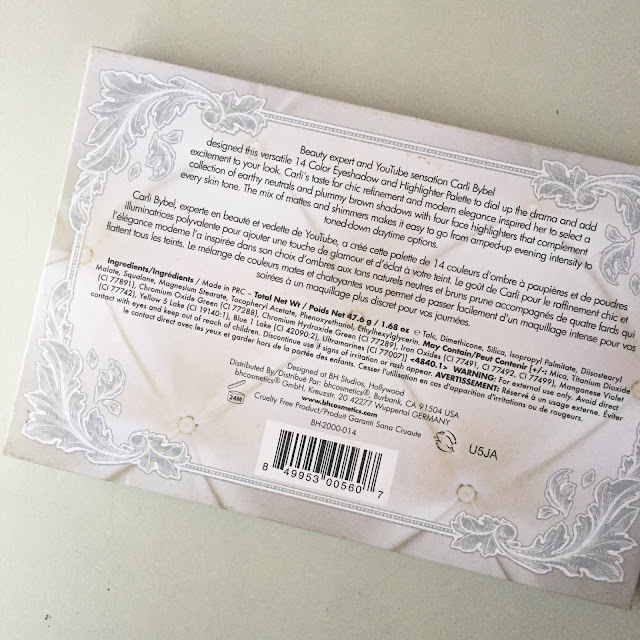 one thing you should know is, when you first bought the item, there's a sheet of plastic of the same size of the palette that is attached in between the mirror and the products. if you're not careful, the plastic might get into one of the pans and destroy the highlights/shadows as well as your heart. as for me, i don't think the plastic is necessary as i religiously clean the palette on regular basis so the opposite side never gets really dirty. but if you're not on the same page as me, maybe the separation method is actually a good idea.. but my point is, i got rid of the plastic. let's talk about the contents. this palette comes with 10 eyeshadows and 4 highlighters and ohhh myyy goddd the swatch pigmentation is sooo niceee! the eyeshadows are a mixture of mattes and shimmer shades, while at the bottom row, there are four highlighters that are equally amazing as well. most of the eyeshadow shades are very neutral. overall, i think this palette is very much a day through to night palette with a nice mix of soft, lighter shades complimented with rich, darker tones. the top row of the palette has more cool-toned mauve and plum toned shades (which for some reasons instantly reminds me of Carli Bybel herself). 4 out of the 5 shades are matte, with one being a stunning pink shimmer. this middle row is full of champagne, bronze, and chocolate shades. here you’ve got 4 shimmers and 1 matte shade. the bottom row comprises 4 highlighter shades, but of course you can use them on your eyes as well. these are probably my favorite part of the palette, simply because of their crazy pigmentation. the shades go from very light to gold-pinkish to a very deep bronze, so they're very versatile and suitable for so many skin tones. the ONLY thing that is lacking from the palette is names for each shade. i mean, if the colours are significantly different (e.g. red/ black/ yellow/ blue) then names might not be necessary. but these shades are somewhat similar to one another.. especially the lighter ones. i just thought it would be easier to refer/distinguish them that way. My thoughts: honestly, i thought it is a representation of me in a form of a palette. i don't know about you, but i can certainly see myself using every single pan in this palette. the colour range made this palette something that i can rely on for almost everything. every single shade is velvety soft, smooth and easy to blend. the shimmer shades definitely appear more pigmented on the eyelids than the matte shades which are slightly more chalky and require quite a bit of build up. the highlighters in this palette are to die for though. they’re just really flattering. seriously, when i first dipped my fingers into the champagne highlight, i knew the palette is a winner. i literally gasped because it's so prettaaaaaayhhh. in conclusion, i am so overly impressed with this palette. it's an amazing quality and versatility for the price point. the colour selection is beautiful. i really love the fact that it isn't one of those typical 'palette for pale/fair skin tone' (y'know what i mean? no offense to pale/fair people though!) it works just as amazing as other uber expensive brands, so what else can i say? Carli Bybel did a masterpiece with it! of course i've experimented with all the colours but i never took any closeups. so i will update this post later once i've done that. however it’s quite difficult to get hold of in Malaysia. i doubt local stores have this palette. i bought mine online from @amazinc.my for RM86, which was the lowest price i ever found around that time. the selling price might has been increased now due to GST, shipping fee, etc so do try to check out several other IGshop or Carousell accounts if you intend to buy it. by the way, this is the product that introduced me to BH Cosmetics. i think the brand is actually a cool cosmetics line. i will definitely try out other stuff sometime, and you should too! 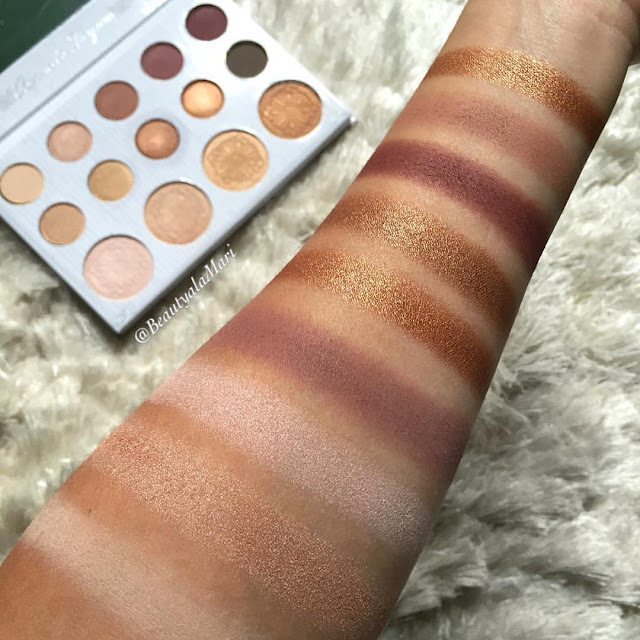 so what are your thoughts on this palette if you have it? let me know your thoughts down in the comments section! if you don't have this, now is the perfect time to start questioning why. i highly recommend you to purchase this palette and add it to your collection.